It Will Leave You Speechless! 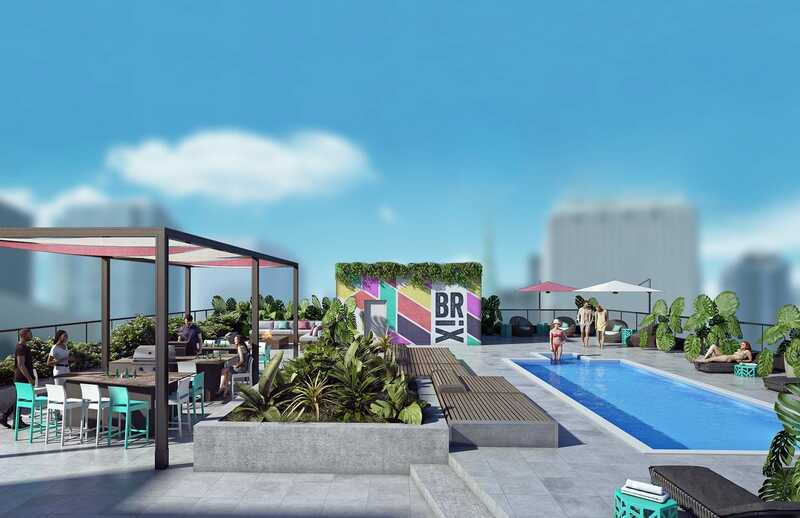 “The really important thing is not just to live, but to live well, so how should we live?” Socrates asked this very question over 2000 years ago and BRiX Apartments is trying to fulfill his inquiry. In May 2019, the 17-story apartment building will be welcoming its first tenants and their beloved pets! Totally unique in all of Canada, BRiX is offering apartments for rent in a leading-edge and futuristic property! 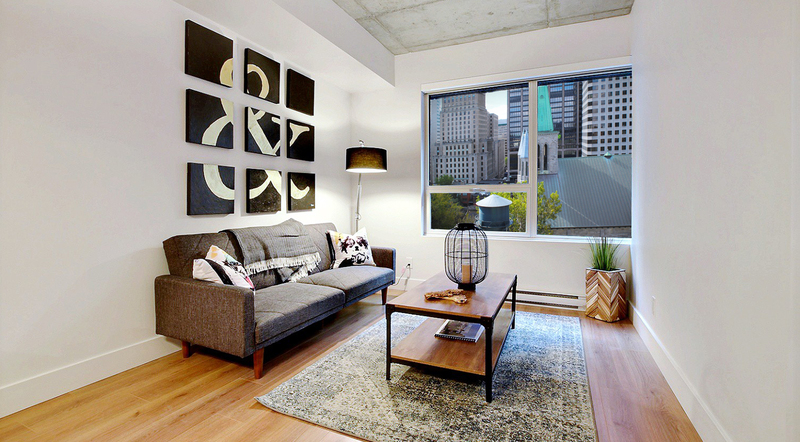 With more than 20,000 square feet of shared living space, your next home is located in the heart of one of the hottest neighborhoods in Montreal. Step outside and you’ll find yourself on De Bleury, just minutes away from absolutely EVERYTHING: The Quartier des spectacles (where many festivals take place throughout the year), Chinatown, the Quartier Latin, and of course Old Montreal, where everyone wants to hang out during the warm summer days. Shops, restaurants, trendy coffee shops and grocery stores. You can go anywhere on foot and public transport is only 2 (literal) minutes away because life is so much easier when you don’t have to drive! 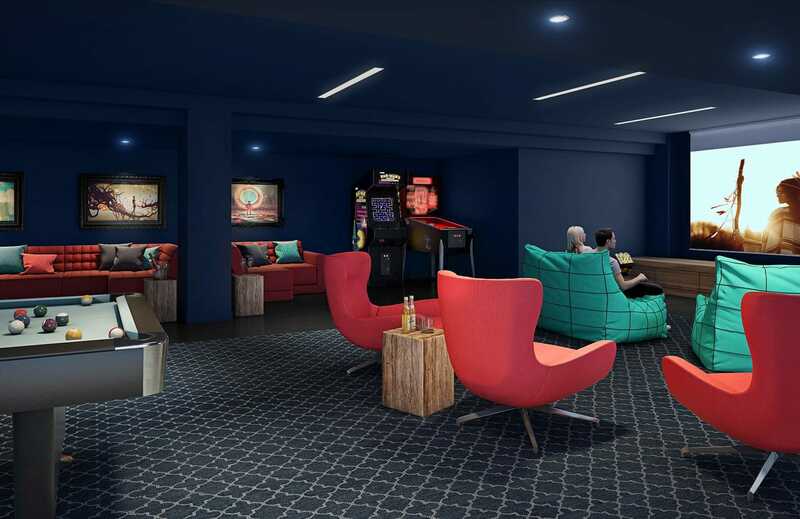 On site, you will find shared spaces so amazing that you’ll never want to leave: A beautiful green courtyard, a huge lounge, a co-working area, a movie theatre, a gaming room (oh, yes! 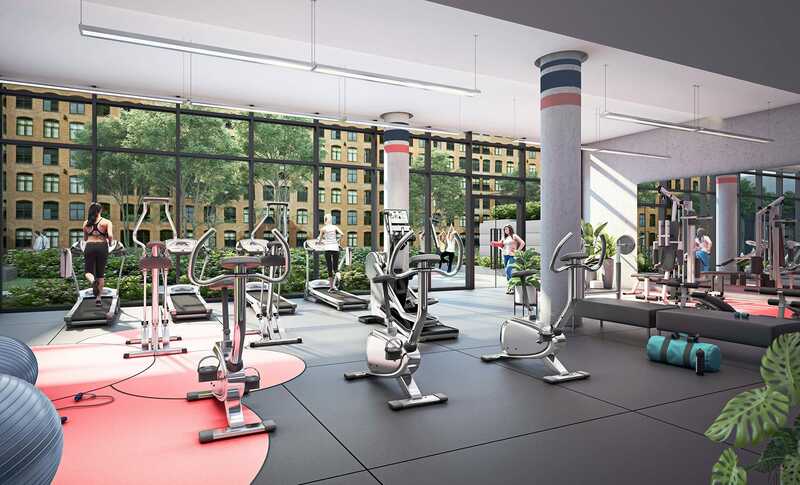 ), a gorgeous lounge on the 17th floor with terrace, another rooftop terrace with a pool and BBQ (perfect for the summer), a gym with a cross fit rig, a yoga studio and a sauna! Not bad, eh? But wait, there’s more, the common areas are only the tip of the iceberg. Living in Montreal means living in a city that breathes art and culture. This will be reflected on BRiX’s walls. The building will exhibit art from local artists as well as movie nights, comedy shows, artistic workshops and much much more. 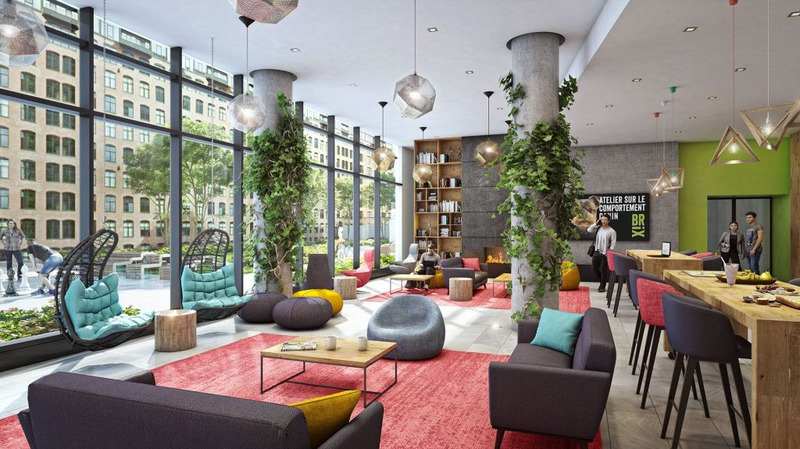 Don’t forget, I’m still talking about an apartment building…not a theater or a trendy place where people meet up, but a community inspired by its surroundings and Montreal’s joie de vivre. 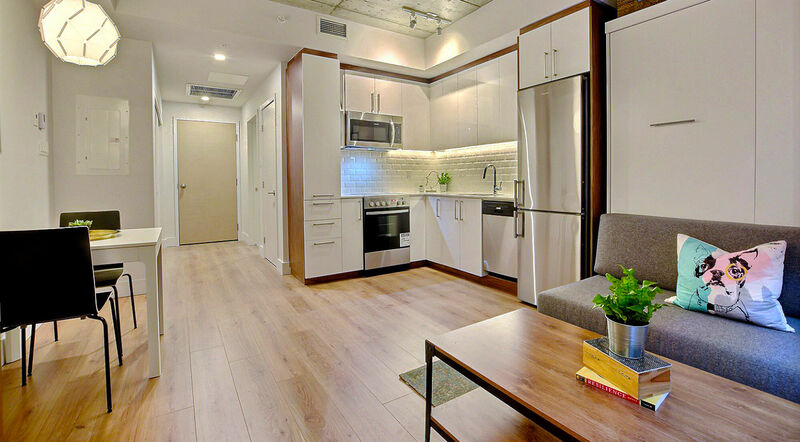 Renting an apartment at BRiX means having all the perks of a hotel room in your very own apartment. Living at Brix means you will have exclusive access to a concierge à la carte. The concierge offers amazing services such as apartment cleaning , dog walking (a dog park is also available on-site), taking care of your cat, etc. Admit it - it’s the first time you hear of such services for tenants, right? I feel like moving in just because of this! Ahead of its time, BRiX is first and foremost an eco-friendly and energy-efficient property (more than 14% above the new standards set by the construction industry). On-site, you will find docks for your bikes as well as charging stations for electric vehicles. The building is equipped with smart temperature controls and separate garbage and recycling chutes on all floors, as well as a composting bin. Also, the rent includes absolutely EVERYTHING! Inside each studio, 1-bedroom apartment, townhouse or 2-bedroom apartment, you will find: 6 appliances (fridge, stove, microwave, dishwasher, washer and dryer), the fastest internet available on the market (unlimited and NOT shared!! ), heating, AC, electricity, and hot water. So when I say everything is included, I really mean it! BRiX was created to give you the most inspiring, eco-friendly home possible…now this is “living well” don’t you think? Still not convinced? BRiX is having two amazing opening promotions: 50% off your first month of rent if you move in May or June of this year. You can also get free parking for a year when you rent certain 2 bedroom apartment models which in my opinion, is VERY practical when you know how hard it is to park downtown. For more information about your dream apartment, visit their website. Once there, you can call or email them to schedule a showing. Good luck!